Percent Tree Cover represents the density of trees on the ground. The data show the ratio of the area covered with branches and leaves of trees (tree canopy) to the ground surface seen from the above (vertical direction). 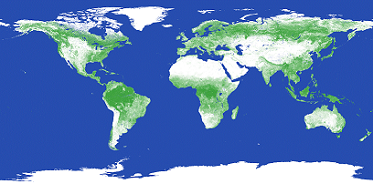 Satellite images of the whole globe from the MODIS sensor of Terra were used for the data creation. As for deciduous trees, which drop all their leaves during the period of low temperature or dryness, the ratio of the most flourishing period of a year (Maximum Percent Tree Cover) was referenced as the Percent Tree Cover. Percent Tree Coverage (PTC) Global version data were developed by the secretariat ofISCGM in collaboration with GSI and Chiba University. The data were prepared by using MODIS data with remote sensing technology. The data covers the whole globe in grids at 500m (15 seconds) intervals (for Version 2). To date, data of two periods, i.e., Version 1 and Version 2, were developed and provided. Percent tree cover is classified into 0% to 100%. Acknowledgement of written sources is necessary. Please show a text, "Geospatial Information Authority of Japan, Chiba University and collaborating organizations. ", on your products.